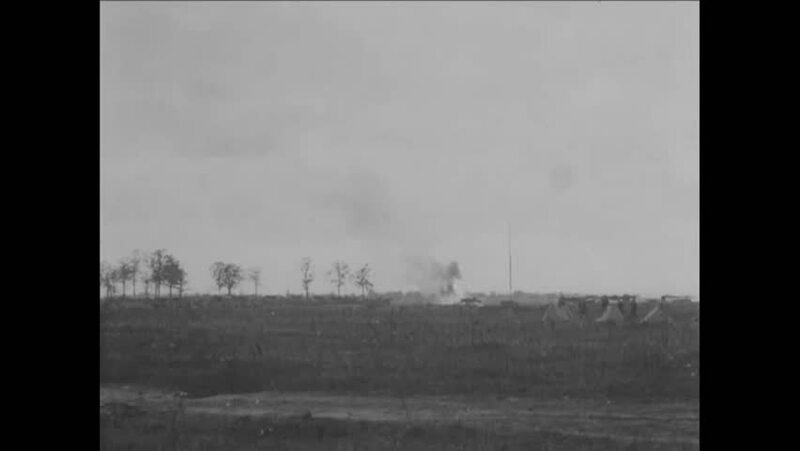 CIRCA 1918 - Allied ammunition dumps are seen ablaze from German shell fire. hd01:23CIRCA 1943 - The smoking ruins of an air attack on a Japanese mountain are shown. hd01:43CIRCA 1919 - Troops of the Chemical Warfare Service set off explosives in field maneuvers. hd00:48CIRCA 1940 - American pioneers spend the night along the Mississippi River in this reenactment from the 19th century. hd00:35CIRCA 1950 - Machine guns and a shell are fired from a tank and prisoners are taken during training in Fort Knox, Kentucky. hd00:171950s: Rain clouds over tree-line. Rain batters window of classroom.